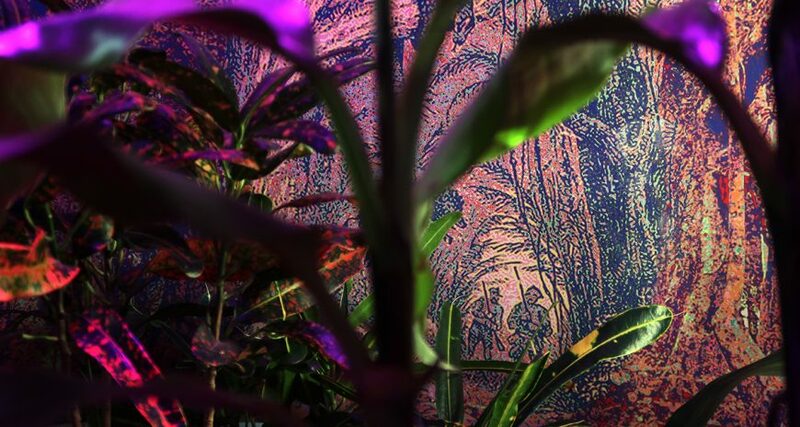 History in RGB consists of a series of prints installed amid plants, lights, mosquito nets, and filters. Representing images of history, popular culture, mythic folklore, landscapes, and creatures, History in RGB proposes alternatives to the systemic representations ordered by colonial narratives. Juxtaposing images stripped of color, the prints are re-assigned with the value of a specific color based on a “tropical” Pantone palette. The re-assignment of color is based on the value system set by red, green or blue. Viewing the print through one of the three filters, select images become visible while simultaneously obscuring other elements. While the filters become tools for revelation and clarity for a monochromatic narrative, they also produce a mottled background by obfuscating the other narratives that exist on the same surface. History in RGB is an extension of Maria Dumlao’s interest in how images and, by extension, history, desire, and experience, are mediated phenomena. As technology and the digital media continue to encroach upon and influence our understanding of meaning and reality, the images with which we are constantly confronted are redefining forces on our consciousness. History in RGB is an exploration of individual and collective history as viewed through multiple lenses. By combining narratives drawn from written and unwritten stories and myths of her native Philippines with formal issues in art (color and mediation of image interaction), Dumlao challenges the hierarchy set forth by different value systems. Maria Dumlao works in combined media, including film, video, sound, photography, and installation. Dumlao’s work has been exhibited, screened and performed at venues including Art in General, Momenta Art Gallery and Schroeder Romero Gallery in NYC, Hyde Park Art Center in Chicago, The Contemporary Museum in Hawaii, and internationally. Recent exhibitions include a solo at Black Oak House and a group show at Asian Arts Initiative, both in Philadelphia, and a two-person exhibition at Recitation Gallery in University of Delaware. Dumlao is a recipient of 2017 Leeway Foundation Art & Change grant. Dumlao has received a BA in Studio Art/Art History from Rutgers College and a MFA in Studio Art at Hunter College-CUNY. Dumlao is an Associate Professor of Art at Bucks County Community College.